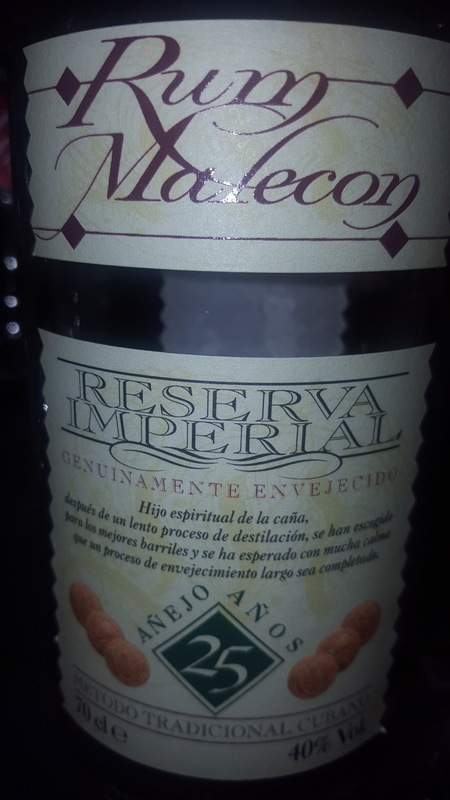 Have you found an online vendor selling Malecon Reserva Imperial 25-Year? Non eccessivamente morbido vista l'età. Si beve con molto piacere ma non lo comprerei. For this range of brand and aged the 25 yrs is by far the best tasting one. Rum Malecon 25y has a pretty standard bottle and label design. Surprisingly light amber color for a 25y old rum indicating very little added ingredients. Nutty and sweet to the nose and palate. Very short burn at the end. Surprisingly good rum. Schönes Mahagoni mit Goldreflexen im Glas. In der Nase überraschend frisch und fruchtig für Sein alter. Dunkle Schokolade, weisse Trauben, getoastetes Holz, gebranntes Karamell und Gewürze lassen das Wasser im Munde zusammenlaufen. Im Gaumen eine sanfte explosion von Aromen. Absolut lecker diese verschiedenen Arten von Kakao und Schokolade im Mund. Dazu gesellt sich noch ein wenig Holz, Karamell, Zimt, Nelken und eine Priese Salz. Im Abgang dominiert die dunkle Schokolade, gefolgt von Karamell, Früchten und Gewürzen. Beautiful mahogany with gold reflections in the glass. In the nose surprisingly fresh and fruity for the age. Dark chocolate, white grapes, toasted wood, burnt caramel and spices make the mouth water. On the palate a gentle explosion of aromas. Absolutely delicious these different types of cocoa and chocolate in the mouth. Added to this is a little wood, caramel, cinnamon, cloves and a pinch of salt. In the finish dominates the dark chocolate, followed by caramel, fruits and spices. Очень интересный ром, очень приятная презентация, добросовестное, сильное, полное тело, древесный, хороший финиш. Équilibré entre amande grillée et épices. Bouche intense...café avec une finale douce épicée. Dufter og smager meget tydeligt af karamel. meget mild ikke for sød. Very interesting rum, very nice presentation, corpolent, strong, full body, woody, good finish. This is a good solid rum. Smells and tastes of caramel, oak, burnt sugar, vanilla, tobacco, and a light hint of spices. Nice! Ännu en favorit till skåpet. Den var överraskande god. Not my cup of tea (rum). Strong, but smooth taste, with very long aftertaste. It is very dry rum. Much better than 15 and 21y. It has some flavours. What a great pleasure to pour a glas of this rum. The taste of nuts, some caramel, vanilla and coffee. And light hint of spices. Not to sweet and a great joy. für mich einer der Besten in der 50€ Klasse. Riecht gut, schmeckt noch besser. Nicht ganz so süß wie ein Zacapa 23 oder ein Plantation XO20, dafür vielschichtiger, würzig. Bleibt lange am Gaumen. Nachteil: die Flasche ist viel zu schnell leer. I have tested the Malecon 18y and the 25y in a row. On the aromas point of view, both are quite simillar excepted the alcohol taste which is weaker for the 25y. This is clearly a good point for this Malecon Reserva Imperial. This rum is well balanced with notes of candied fruit and vegetable notes of flowers. The alcoholic side disappears with time and leaves room for softness . Good rum to finish dinner with a good cigar or chocolate. Dieser rum schafft eine gute balance zwischen milde süße und würze. Nussaroma, kaffee, Vanille und exotische Gewürze. Cremiges Mundgefühl. Habe mir für 25jahre aber irgendwie mehr erhofft. quando l'ho assaggiato per la prima volta me ne sono completamente inamorato. Meno alcolico rispetto al Zacapa 23, che in questi anni va molto di moda. Tenuto in bocca per un po' manifesta la sua morbida "setosità": per me è spettacolare!! !